The traditional forklift truck can become a versatile piece of kit, able to handle a variety of different tasks. All that is required is the selection of appropriate forklift attachments. Utilising these attachments correctly transforms the forklift, increasing the trucks productivity and enabling it to complete a wide range and variety of tasks. The money which can be saved through utilising forklift attachments is astounding. For instance rather than buying machinery to fulfil functions such as work platforms and drum handling. You can instead purchase forklift attachments, these are an economical alternative, saving you money whilst utilising the productivity of your forklift. With a correctly equipped forklift a small workforce can achieve a variety of tasks quickly and easily. 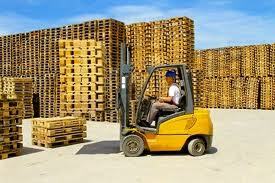 To demonstrate, the traditional forklift is adapt at carrying extremely heavy loads which are stored on wooden pallets. The truck may be required to lower pallets from high warehouse shelves; it may also be required to raise loads to high places. However with a selection of forklift attachments, a traditional forklift can achieve so much more. In winter months a forklift can be used to clear snow, ice and sleet from outside working and loading areas. How you ask? With the purchase of the innovative forklift mounted snow plough. 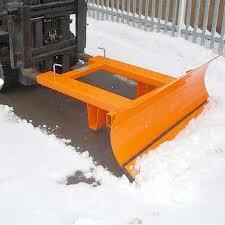 The plough allows you easily and effectively to clear the worst the winter can throw at you, safely and easily. A task which would take five people an hour can be easily achieved in half the time by one forklift, saving you time and money. Rather than having to purchase equipment specifically designed to transport drums, a cost efficient forklift attachment will do the job. A variety of options are available allowing for the provision of drum movement, ranging from single drum clamps and grabs, to more specific drum attachments such as double drum clamps and drum tippers. Drum tippers are a great solution to any problem which involves the emptying or pouring of substances out of drums. The advantages of using machinery over manpower are many. Including efficiency, safety and the distance which a forklift places between the operator and the drum, this is especially useful when emptying hazardous drums. There are a wide variety of forklift attachments available, allowing you to customise your forklift in order to fulfil any task or requirement you may have. The economic benefits of forklift attachments are twofold. Firstly they reduce the cost in order to provide machinery suitable to the task, and secondarily they allow the user to get more out of their costly forklifts. Handling equipment online provides a vast array of different forklift attachments suitable for a variety of tasks. For more information or for any questions you may have surrounding forklift attachments and their implementation, please do not hesitate to contact our technical team on 01384 895859. This entry was posted in Handling Equipment and tagged forklift attachments on May 9, 2013 by admin.